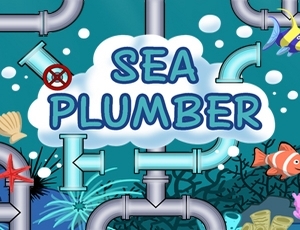 Dive into the ocean and become an extreme plumber in Sea Plumber. Put your brain to the test in this puzzle game: Repair the pipes in the deep and become the champion of plumbing.brbrSetting up a gigantic pipe system to get the water out of the ocean seemed like a good idea, until the pressure broke the whole thing! Now that everything is a complete mess, you’ll have to solve this problem by creating a line between the two last points still in place. Touch/click on pipes to rotate them, then send the flow to the right pipe.